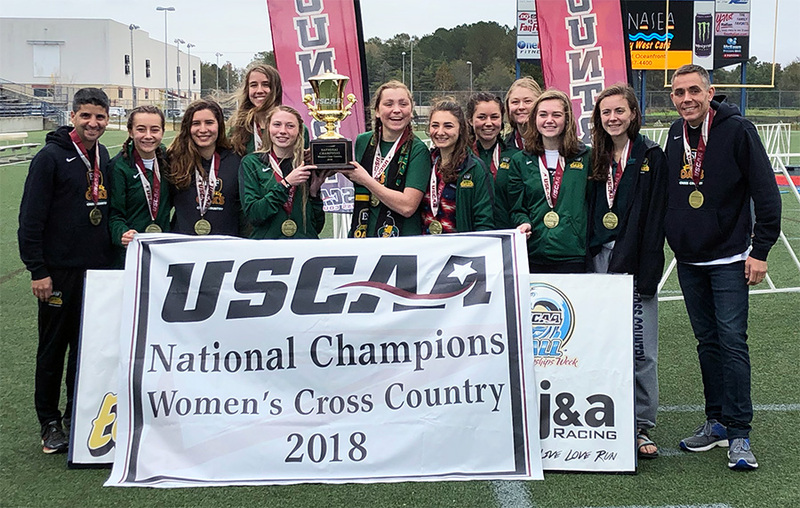 With the Cross Country National Championship trophy always so close, third place in 2015, fourth place in 2016, second place in 2017, ESF's women's cross country team finally brought the trophy home, winning their first USCAA National Championship in program history. Senior Marissa Lathrop capped her stellar ESF career placing first overall in the 6K race with a time of 23:58. ESF rounded off the top five with sophomore Julie Romano finishing third overall with a time of 24:04 and freshman Cassidy Engleson with a fourth place finish time of 24:25. "Our goal all season was to win our first ever USCAA national championship. The ladies worked hard all summer and fall. Along the way, we beat some really good NCAA division III teams at invitationals, and it all came together at nationals where we completely peaked! To send our seniors off this way (which includes the best runner in ESF history, Marissa Lathrop) really makes it special." said Head Coach Mike Melfi. The men's team finished second overall. SUNY Delhi was the overall winner for the second year in a row. Senior Ethan Appelgren was the top ESF finisher with a sixth place overall finish and a time of 27:17. "Having lost our second, third and fifth runners from last years team that finished second at nationals, we were determined not to make this a 'rebuilding year'. Many guys who were not even in the mix last year, stepped it up big time this season. We love our depth and that helped to a second place finish once again. The men also knocked off some very respectable NCAA division III schools this season that we typically do not beat" said Melfi.